I have been playing around with the techniques that I learnt when I went to Technique Overload in Melbourne with Tim Holtz (I said a while ago I would post some projects 🙂 and so I was making some tags and decided to add this sweet Winterland tree die from Memory Box. I made the background using 2 of the new seasonal distress inks (Picked Raspberry and Salty Ocean) and press the ink pad onto the kraft sheet. I also used Dusty Concord. I then sprayed with water from my Mister so that the ink ‘beaded’ up and then swiped the tag through the inks. I covered the tag and then heated it to dry it a bit with the heat gun. One of the tips that Tim shared about creating backgrounds is that it is about getting layers of colour, so you need to dry it a bit in between. This helps prevent your background becoming all ‘muddy’ and the colours mixing into one colour. I then swiped again and dried it again and then just tapped it onto any leftover spots of ink and then dried it again. I then spritzed my fingers with water and flicked water spots over the background and because the distress ink interacts with water it kind of removes some of the colour/pushes the colour away. This technique is describes as Spritz and Flick and is a load of fun. I had a look on Tim’s blog and can’t see a video for it – but it is in his Compendium of Curiosities Vol 2 book. I knew how to do this technique before I went to the workshop but like I said it is always a fun one but make sure you don’t mind if you get inky fingers ! (by the way the craft scrub from Ranger is excellent for removing ink off fingers and is actually not hard on your hands either). Jill Foster also often uses this technique and I think she makes beautiful cards. 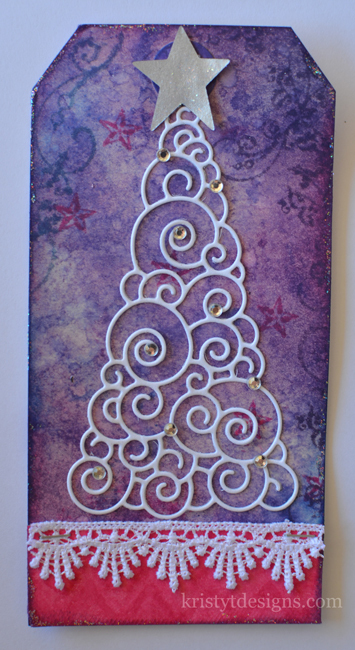 So once I was happy with the background I did some stamping with the same 2 new distress inks. I made the pink section of the tag by using Picked Raspberry distress ink directly to the tag and then laid the Studio Calico Huey’s masks- chevron mask over the top and misted with water and then dabbed the water off and heated with the heat gun. I die cut the star and the tree and assembled the tag as shown. I put some distress stickles on the star and also used my finger to add some to the edges of the tag). Some gems just finished it off. Thanks for stopping by and I hope you have a try of the Spritz and Flick Distress technique. Supplies: Hot off the Press – Christmas Silhouettes and Shadows, Distress inks – Picked Raspberry, Salty Ocean,Dusty Concord, Distress Stickles – Starburst, Memory Box Die – Winterland tree, Gems, Lace, Tiny Attacher, Studio Calico Mister Huey’s Mask – Chevron, Sizzix – Primitive stars, Silver paper, White paper, tags.